Okay, since we're in the off-season, and spoilers seem slim, I thought I'd create a little diversion for us. Let's discuss the teams from a past season who don't have threads. How about TAR 7? 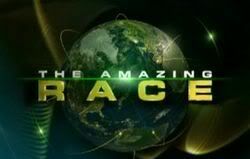 Susan & Patrick are the first mother/son Team in the history of THE AMAZING RACE. Susan is from Hamilton, Ohio and Patrick lives in Hollywood, California. Susan is the Director for Judicial Affairs for Miami University in Ohio and Patrick is a writer. Their primary motivation for participating in this Race is to see the world with each other and have stories to share for the rest of their lives. Susan has been married to Patrick’s father for 34 years and also has a daughter, Elizabeth. She earned her college degree as a “non-traditional” student, since she was a mother at the time. She enjoys shopping, gardening and traveling and describes herself as stylish, demanding and prepared. Patrick says he is extremely close with this family, and they’ve always been very supportive of him, including when he told them he was gay. However, his mother disagreed with his decision to drop out of college (Miami U) 30 credits shy of his degree. Patrick describes himself as Machiavellian and strategic. I didn't like them at all. And Patrick was so whiny. why bother. Just run your own race and get over it. Susan & Patrick just didn't seem competitive enough to me. Patrick should have had a better attitude rather than concluding that all was lost on Leg 4. They seemed competitive enough on the first two legs. They seemed to lose it all after their near-elimination on the third leg. True. I agree with that. so he may as well slog away eating the meat.. He ate all the meat, but before Debbie & Bianca came, he pretended that he was going to quit. He never actually did. Page created in 3.659 seconds with 31 queries.